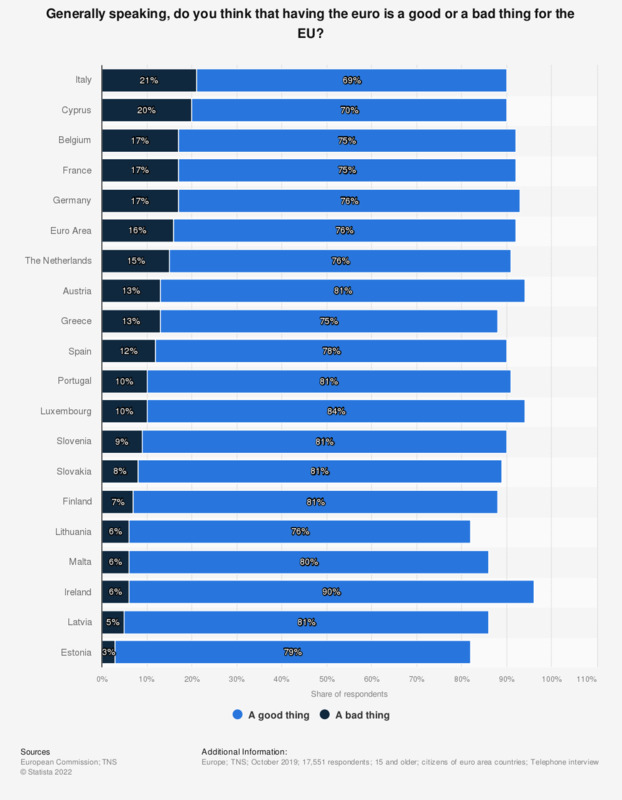 This statistic illustrates the general perception of the euro's role for the EU amongst the population of all 19 euro area (eurozone)countries as of 2018, broken down by country. It can be seen that the opinion of the euro for members of the population in the Republic of Ireland and Luxembourg was predominantly good, with 87 percent and 82 percent of respondents respectively, stating it is a good thing for the EU. On the other hand, the share of people stating that the euro is a good thing for the EU in Cyprus stood at 65 percent for the same time period. Overall, the share of the euro area population stating that the euro was a good thing for the EU stood at 74 percent as of 2018.